Did you know that you can post to a WordPress blog in a number of different ways? Here are 3 alternatives to create content in WordPress other than logging into the blog admin using the built-in editor. Built into WordPress is the ability for the software to check an email account and post each message it finds to a blog. This serves as a quick and easy way to send an email message and publish new content. To set this feature up, the fist thing you’ll need is a custom, secret, email account. Since WordPress posts everything that goes to this account, it can’t be one that serves more than one purpose, or that gets spam. Once you have that, go into WordPress and go to the Settings > Writing page. There you’ll be asked for your email server, email login, and password. After that’s setup, you’re almost ready to go. The other thing you’ll need is a line of code in your blog template that tells WordPress to check the email account. If embedded in your blog template, every time the page loads, WordPress will check the email for new content. The code you’ll need can be found here. This is a great feature for people who live in their email as they can write a blog post without ever leaving their email application. However, the downside to this is that I’ve been unable to get it to work with images, categories, tags, or any customization other than post title and the actual post content. The ease of posting is trumped by the lack of customization. Note: There is also a plug-in called Postie that takes email integration to the next level, but I haven’t yet tested it out. Quickly post with the Press This bookmarklet. Press This is a bookmarklet that you can add to your browser. When you find something you want to blog about, select it and click the Press This bookmarklet. It’ll then open a small WordPress post window that is auto-populated with the selected text and allow you to put the finishing touches on the post. The nice thing about Press This is that it can grab text, images and even videos of the web. You will also get all WordPress post options including categories, tags, the media bar, and WordPress’ WYSIWYG editor. You can even save the post as a draft for later use. Missing is the ability to change the post slug and preview your post, but those are pretty minor for most users. You also can’t upload a custom image, but you do get a nice image selection tool that shows you all the images from the page you are posting about to insert into your post. 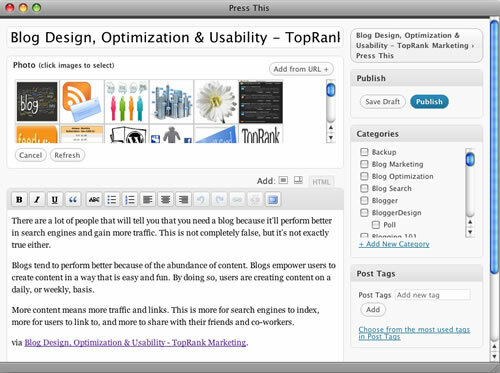 The Press This feature is integrated into all WordPress blogs and can be found under the Tools menu. It’s a great way to make quick blogs posts that reference information found on other sites. The third way would be to use desktop blogging software, or browser add-ons, to compose posts. These offer an alternative look and feel, additional features, and sometimes, a less confusing way of creating blog posts. To use a desktop application to post to your blog, you’ll first need to enable the functionality in WordPress. This can be done by going into WordPress and then to the Settings > Writing section. Check the “Enable the WordPress, Movable Type, MetaWeblog and Blogger XML-RPC publishing protocols.” checkbox and save changes. Once that’s done, we are ready to configure a desktop application. There are many more desktop blogging applications out there. Some are free, some are paid, and some work better than others. If you find one you really like, let us know in the comments below. Posting to a blog doesn’t have to be done through WordPress’ admin interface. There are alternative solutions from email to desktop apps that can help make it easier, or even more convent, to create blog content. Personally I like what WordPress offers. I’ve tried a few desktop applications, and briefly tried the email posting option, and I always return to WordPress via the built-in blog editor. But that’s just me. What do you prefer? I prefer the WP editor, just because I use Thesis theme and usually add images and other stuff like SEO in special fields which do not appear in software editors. For me there is no need to use a software for blogging. Press this bookmarlet is new for me, going to have a try. Thanks for sharing. just tried Press This. works great!